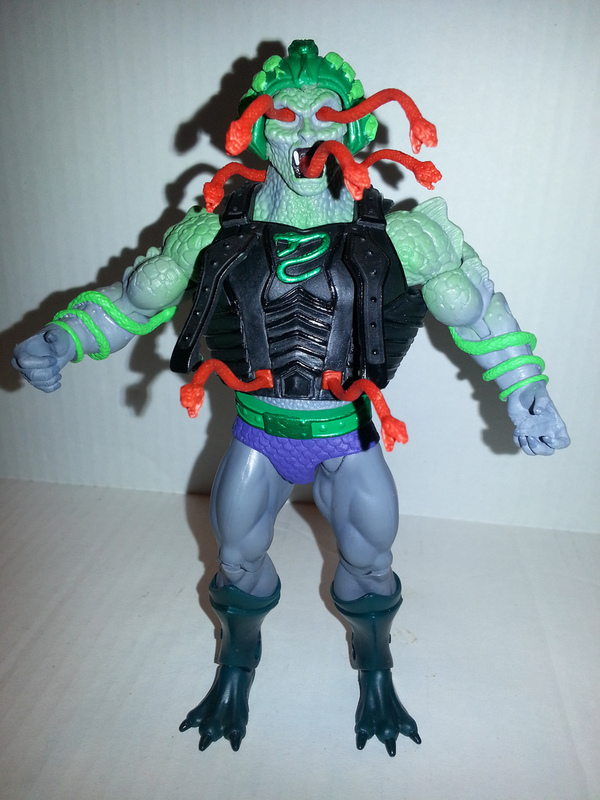 Snake Face, like most other MOTUC figures, has multiple parts reused from other figures. He comes in right at the 7 inch Mark and is a beautiful update of the original action figure. If you're interested, Snake Face uses the Skeletor boots,feet, and hands, the standard muscled knees and legs, and the Whiplash torso. 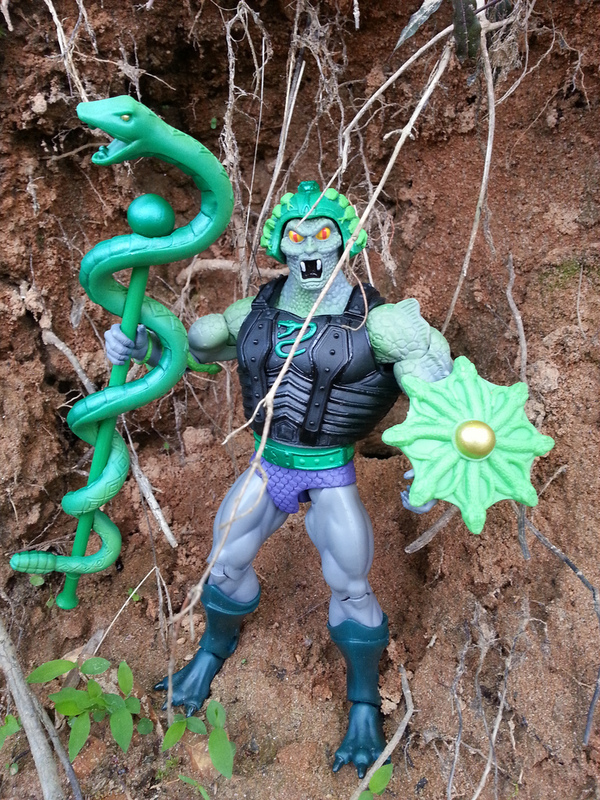 His loincloth, shoulders, and arms all all new.He also features a ton of extra parts which allow you to replicate the vintage figure's action feature of snakes popping out of the character's eyes, mouth, and chest. Snake Face has the same articulation as the standard MOTUC figure: hinged/rocker ankles, boot swivels, hinged knees, ball jointed hips, a waist swivel, an ab hinge, peg/hinge ball jointed shoulders, bicep swivels, elbow hinges, wrist swivels, and a ball jointed head. I've said a number of times that Mattel's MOTUC figures have the most solid articulation on the market and Snake Face is no exception. I'm also happy to say that I've had no quality control issues with him. Could it be that Mattel really has gotten a good number of their ducks in a row? I'll mention that while Snake Face has removable chest armor, his ab joint isn't hindered too much by it, as it's made form a fairly flexible plastic. Snake Face features quite a few new parts which contribute to making him feel like an extremely unique figure. The torso and arms blend together to give him a very creepy and scaly appearance. The arms have plenty of spikes and ridges on them to make the effect all the more impressive. Also, check out his forearms: Snake Face actually has snakes sculpted around his wrists and forearms which craw off above his elbows. It's a really cool detail that looks fantastic. 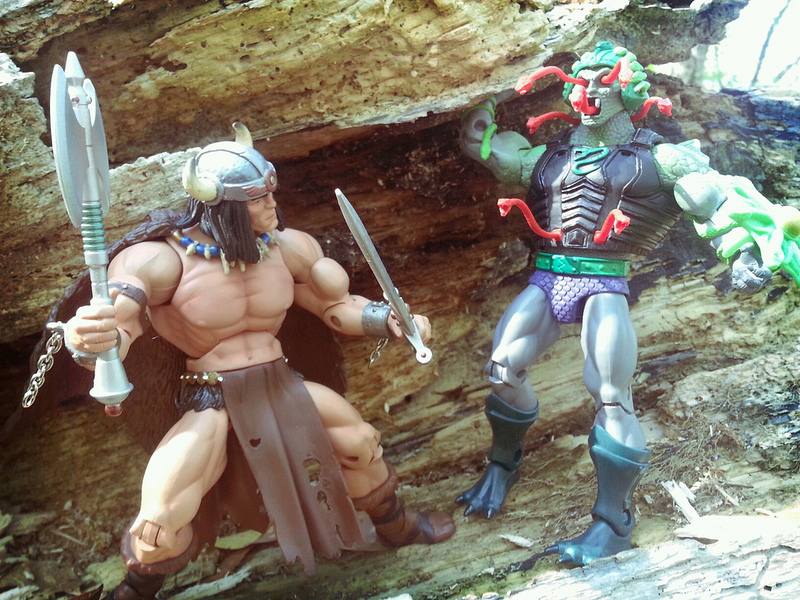 The loincloth is new and looks like some neat, scaly trunks. While everything below the waste is reused, it's also a bit plain. Still, the upper torso is the main focus and it nicely makes Snake Face fit in with his fellow Snake Men while giving him some distinctiveness. The head sculpts are not, however. Snake Face comes with two portraits and both of them are excellent. They're nearly the same with the exception of the giant snakes protruding from the head and mouth on one, but they still give the figure two distinct appearances. The face nicely matches the scaly torso and arms and features an open mouth with protruding fangs and high cheekbones with sunk in, creepy eyes (he's kind of a Snake Man version of Peter Cushing). The helmet he's wearing is also well ornamented. It's similar in style to Man-at Arms' helmet, but features plenty of serpentine reliefs and on the non "snakes popping out" head, you can see the tails of the snakes hanging down the back of Snake Face's neck. Gross! The red snakes popping out of his head are molded in red plastic with no paintwork. They look very striking and dynamic as they all strike forward from out of his head. Snake Face's paintwork really helps accent the sculpt. His gray and green color scheme with purple and black accents looks quite nice and differentiates him from nearly every other figure. All the paint work is nice and clean with little to no slop. He also has a nice blend of green over the gray plastic on his upper torso, face, and shoulders, that accents his look. I do wish that the snakes on his wrists and helmet had a bit more detail, however. They look a bit flat, even if they're not intended to be real snakes. Another positive aspect of the figure I'll point out is that there is nice usage of metallic paints. The snake on Snake Face's armor, his belt buckle, and the ridges of his armor all have a metallic sheen to them. I think perhaps a little paint on the snakes bursting out of his head might have helped set this guy over the edge, but as it is he is a very solid figure. Vikor vs. Snake Face- round 1: Fight! Let's talk about accessories, because Snake Face has a ton. if you count his extra portrait (I do), he comes with eight accessories. They are his vest, the two removable panels from his vest, two two removable snakes that attach to his vest, his extra portrait, a staff, and a shield. The original Snake Face figure from 1987 had a lever on his back that when activated caused snakes to pop out of holes in his head and two panels on his chest opened to reveal two more snakes. Since MOTUC figures don't have action features, Mattel has replicated this by 1.) giving Snake Face an alternate head and 2.) having removable panels on his vest that allow for two plastic snakes to be plugged in. The snakes plug in easily yet stay in nice and tight. While the panels fully remove from the vest, you can actually put the snakes in while only unsnapping the bottom of the panel if you'd like. The vest looks a bit over sized, but is nicely sculpted and painted. As far as actual weapons go, Snake Face has the same staff that King Hiss and Rattlor have (his is a darker green than Hiss') which is still as nice of an accessory as it was the first time around.  I like having something like this that unifies the faction, kind of like how all the Horde members have crossbows. The shield is ok. It does a fair job of replicating the original Snake Face shield but really looks pretty lame compared to the excellent shield released with the NECA staction. Snake Face wasn't one of my most anticipated figures, but I'm very pleased with how well he turned out. He manages to be an excellent homage to the vintage figure while still maintaining the more serious feel and appearance of MOTUC. Mattel did an excellent job of translating the action feature of the vintage figure into a line where few action features exist; if you're a completest and have the money, this wouldn't be a bad figure to have two of on display. 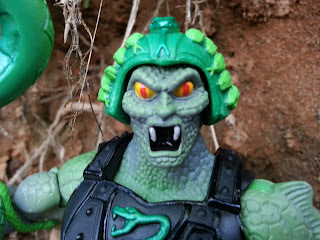 As it stands, Snake Face is an excellent addition to the Snake Men roster and to the MOTUC line as a whole. Now we just need Tung Lashor and Sssqueeze to finish the vintage Snake Men! Barbecue17 hates snakes. Really. Snake Men action figures are as close as he'll come to those slithering serpents. You are assured to not find any pictures of snakes on his Flickr account.